Advent calendars – they’re not just for the little ones! 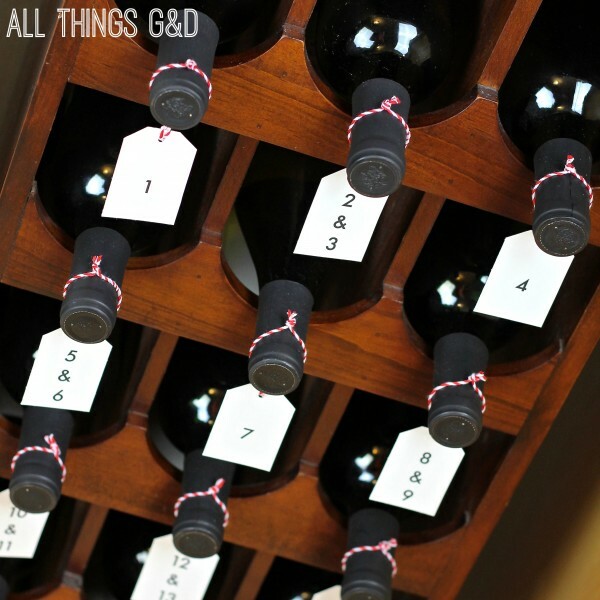 I got such a laugh over creating this “Mommy’s Advent Calendar” for our holiday home – perfect for all the other wine-loving mamas (and papas) out there! As much as I’d love to say this idea was all mine, the truth is I’ve too busy drinking wine to think of something this clever. The idea came from a picture my friend Kelly shared with me (unsourced, unfortunately) and I knew I had to bring it to the G&D household. To make, I simply printed off “countdown” tags on my printer, cut them to look like tags, punched a hole at the top, threaded baker’s twine through the hole and hung them from each bottle. 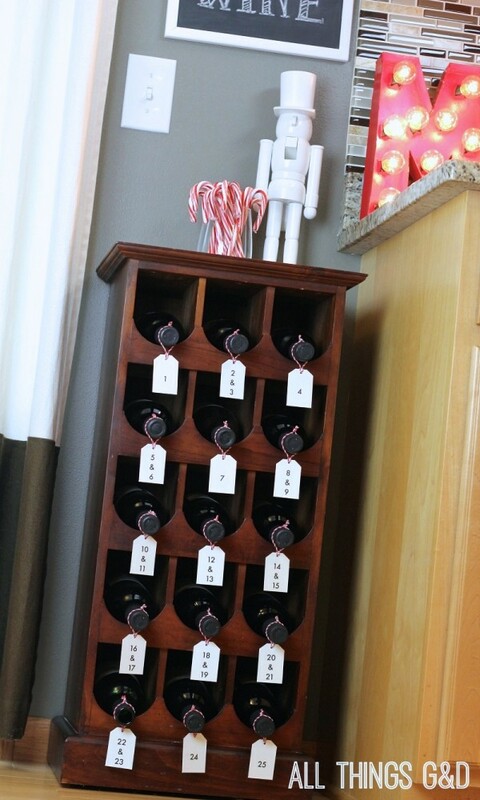 I only have a 15 bottle wine rack, so instead of counting down the days until Christmas one by one, I doubled up on a few of them. 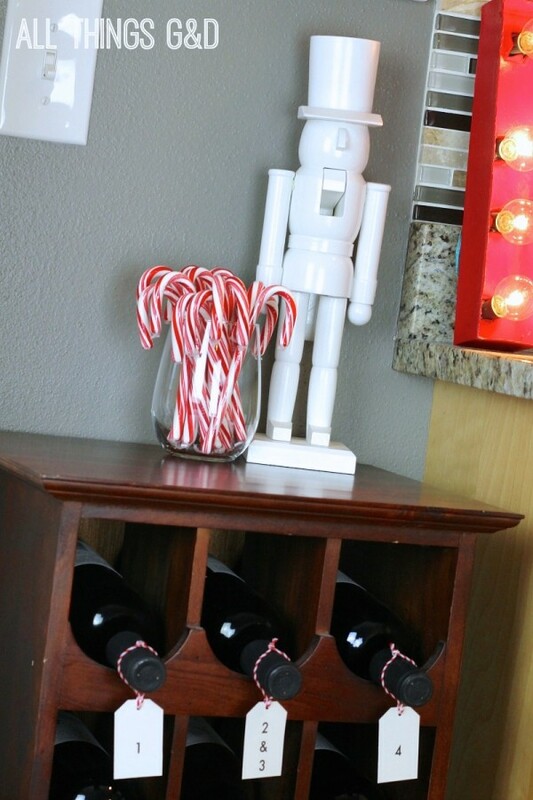 Above the wine rack is this great little nutcracker – who is now my “wine guy” – standing guard over my wine. 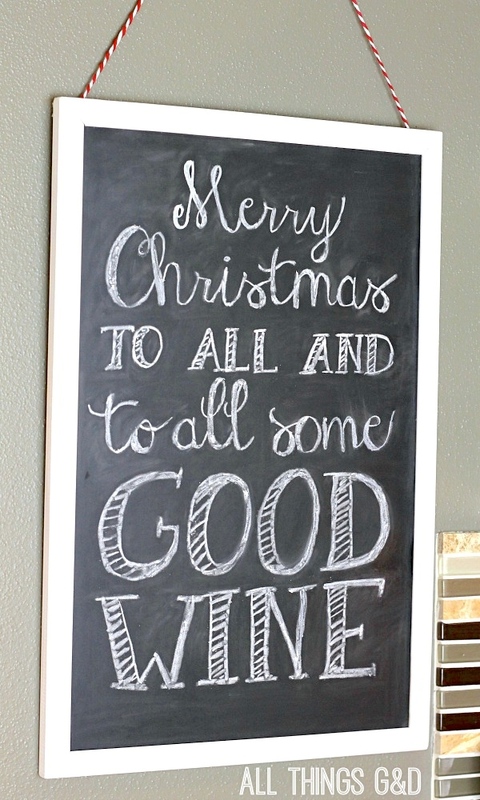 Hanging over Chuck is this great little holiday message with a wine-lover’s twist that I added to my chalkboard using this chalkboard lettering tutorial. How many of you plan on having your own little advent calendar next Christmas? 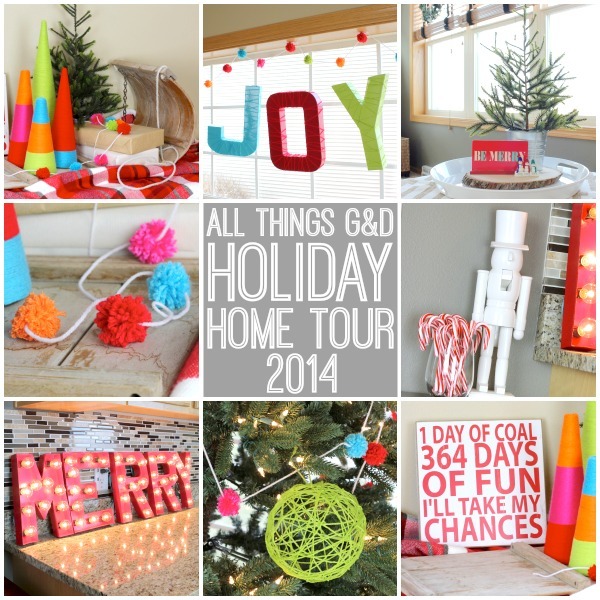 See more of our holiday home in our 2014 Holiday Home Tour! It’s like you know me. Hahaha! Thank you, Kim! Thank you so much, Ashley! It was so much fun to do, haha! Where did you get the beautiful wine holder? Yes, please share! I love the wine holder too! Thank you, Jennifer! 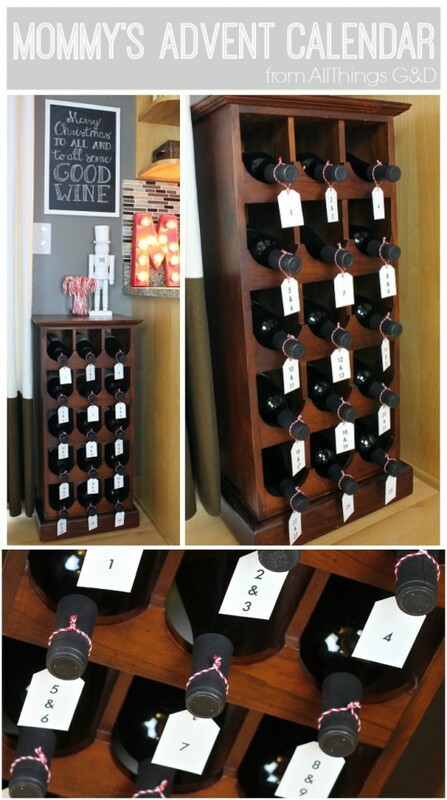 The wine rack is from Pier 1. It was a gift from G about 16 years ago on our first Valentine’s Day. Even then the man knew exactly the way to my heart, haha. G bought me this wine rack as a gift for our very first Valentine’s Day together! #truelove It was from Pier 1. I have a yearly countdown on my wine rack! LOL! Love that idea, Karen! I LOVE these (sharing)!! Totally makes my morning! Thank you so much, Thrifty DIY Diva! OMG this is amazing! haha This could be a weekly thing too with 52 bottles, no? Love that idea, Jamie! I think we could make it happen.